1. Login to our website and navigate to the My Services control panel service summary page. The easiest way to do this is to click on Overseer Panel 2.0™ at the top right of our home page or just click the link provided above. 2. Next, you want to go into the Dashboard of the ARK service you are wanting to add mods to. Just click that Dashboard button to the right on the My Services summary page. 3. The -automanagedmods command line switch is enabled and added for every new process that is setup but you can check the Command Line Editor to make sure that it is there. If the -automanagedmods switch is already in the Active Command Line box you can move on to the next step. 4. Now that you have confirmed the -automanagedmods switch is on your command line open up the File Manager on your Dashboard. 5. Navigate to the ShooterGame/Saved/Config/WindowsServer directory and right click on the GameUserSettings.ini file and click on Edit. You can add as many mods as you wish but keep in mind that the more mods you add the higher the risk of performance issues. Start your server when you have the mod ID’s in place. 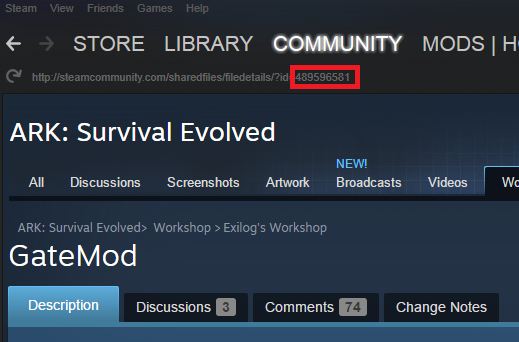 The server will start at 54MB of memory while downloading the mods and go to 55MB of memory while committing/extracting the mods. Allow your server 5-10 minutes to fully boot up. 6. Not sure where to find the ID of the mod you want? Here is a screenshot of what to look for in the Steam Workshop.